Student M: You suggested to us that as students we should try to steal our teacher's way. Student M: I-- I-- something like that. SR: Did I? Did I say so? No. [Laughter]. I have no idea, you know, being stolen my wife. [Laughs, laughter.] Okay. Student M: Do you-- will you please explain how we commit that crime? Student M: To steal your way. SR: Oh! I thought you said “wife.” [Laughing, laughter.] “How-- how I should steal my teacher's wife!” Way! I see. I shall be very glad to be stolen my way. How you steal teacher's way may be not difficult, but may take pretty long time. But even though you are-- if you are patient enough, or if you like him, naturally you will-- eventually you will steal his way completely. That is true. It happens in that way. Even though you don't try to imitate his way. Or even though you hate to, you know, to steal his way, it is quite-- I don't know why it happens in that way. So, you know, to be a teacher is awful, you know [laughs]. We don't know-- because we don't know who is stealing-- who or when, you know, stealing our way. So it is-- you should-- you reminded me a awful thing I was almost forgotten. And students will learn something a teacher, you know, want him not to, you know, steal or learn. If, you know, his teacher is forgetful, his student may be forgetful easily, quite easily. But even though his teacher is patient it may be difficult-- it may take long time when his student become patient as his teacher. So something what, you know, teacher want his student to steal something, he may not steal it. 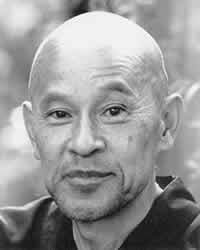 So we say-- Dogen Zenji says, “You-- we must practice hard for our descendant, for our disciples,” you know-- not for himself but for-- if he-- if we know how important it is to have good disciple, then he must practice very hard. That is very true. When we come to this point, you know, our practice is not just for us-- or our practice is just for disciples, or for others, rather than for ourselves. So when we have real relationship of teacher and disciple, that relationship is much deeper than the relationship between your children and you, or your wife and, you know, you or husband and you. It is much deeper than that.